Hi, I’m interested in Airmouse with integrated Keyboard Shortcuts to Make Streaming Easier! Bluetech 021 948 8230 . Please contact me. Thanks! DetailsAirmouse with integrated Keyboard Shortcuts to Make Streaming Easier! 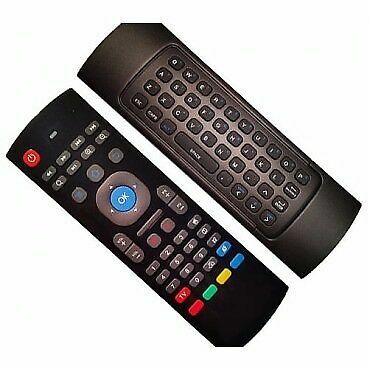 Easy Stream Recommended Airmouse and Keyboard 2.4G for Android TV Box. This is our personal favourite for getting around Kodi. The keyboard on the back simplifies the updating of wizards and apps. 2.4GHz Fly Air Mouse Wireless Keyboard Motion Sensor Remote Control. This fantastic plug and play remote control works up to a distance up to 10 meters. It has a Gyro + 3G sensor, which is very convenient to use in horizontal and vertical modes for motion games and typing and ease of access. Its power consumption is less than 10mA in full operating mode! Bring home the same pain relieving treatment you get at your therapist or chiropractor's office with Magic Massage's Ultra TENS pulse massager. Magic Massage Ultra is a feature-rich neurostimulator that can be used for the relief of pain, soreness, cramps, and also muscle conditioning. Weighing less than a typical smartphone, the Magic Massage Ultra slips in most pockets and can be taken anywhere including the office, a sporting event, the car on your commute to work, or even at the movie theatre. The backlit, easy-to-read digital control LCD display shows each mode in use, the intensity level, the timer, and the battery life remaining. The Ultra features 16 massage therapies: Deep Tissue, Chop, Knock, Kneading, Stroke, Acupuncture, Butterfly, Effleurage, Sports Mode, Thai, Swedish, Pulsing, Reflexology, Auto Combination, Auricular Massage, and Trigger Point. Each massage setting can be personally adjusted with 20 levels of intensity from soft to strong pulses to cater to your specific needs. The Magic Massage Ultra is an FDA-Cleared Class 2 device and is registered safe for over-the-counter sale to consumers without the need for a prescription. The Ultra features a lithium battery with an incredible battery life of over 40 hours on a single charge. Included with the Magic Massage Ultra: Magic Massage Ultra TENS massage device, 2 electrode connector wires, 2 small electrode gel pads, 2 large electrode gel pads, 1 pad holder, 1 USB/AC charger, and an in-depth user instruction manual. Pain management is now within reach with Magic Massage Ultra. RETAIL POINT OF SALE SYSTEM FOR SALE!! !